WHEN DO WE START MAKING PROTOSAMPLES? DO WE NEED TO DO FINAL SAMPLE (PRE-PRODUCTION) BEFORE BULK PRODUCTION? IS THERE A NEED FOR MAKING SALES SAMPLES? WHEN DO WE BEGIN BULK PRODUCTION AND WHEN DO WE START SHIPPING? HOW DO WE ASSURE THAT WE CAN SHIP ON TIME AND HOW DO WE GUARANTEE THAT OUR QUALITY IS ACCEPTABLE? HOW LONG IS THE SAILING TIME FROM OUR FACTORY TO OUR CUSTOMER’S PORT OF ENTRY, AND WHEN DO WE KNOW WHEN IT IS TIME TO SHIP? 1. First with Concept and Design – this is where we define our customer’s target market, main consumer , and product needs, and what motivates their consumers to buy their bags or accessories. We meet with our customer so we can establish the Design Guidelines on new concept: in terms of functions, looks and possible cost and how the product concept will be different from existing products in the market and thus become a winner. Using focus group discussion, we identify key features that their consumers would need. 2. What will be our design format? First, it will be a rough sketch (possibly 2 to 3 concepts) indicating how the product will look like, how it will perform, what it will be made of and how it will be made, and an estimate on how much it will cost. Once the new concept is selected, we will proceed with final design process and color rendition. 3. How much do we charge on Concept and Design? - We always assume that our customers fully understand and appreciate the time, money and effort that goes into each of the products that we design and develop exclusively for them. We also understand our customers’ sincere commitment on every program that they want us to do. Therefore, in doing our best to meet our customers’ expectations, we anticipate that our customers will proceed with manufacturing whatever we have designed and developed for them. 4. How long does it take to do a design? - About 3 to 4 weeks depending on the number of styles. 5. What if our customer provides their own design? – Perfect! This will cut down development time and we can proceed with protosamples right away. However, we still have to determine and confirm the feasibility of manufacturing the design using our existing machines and equipment. 1. Based on approved final design, we will make and submit our first protosample using available fabric/colors, hardwares and existing molds during which time our customer will give their comments and changes. We will also provide our customer tentative cost and delivery leadtime. 2. Based on comments and changes we receive from our customer on the 1st protosample submitted, we will make and submit a revised protosample (2nd proto) with the corresponding revised quotes. 3. How much is the cost to do protosamples? - Normally we do not charge our customers for the 1st two samples, provided our customers take care of courier cost for the protosample from our factory to their office. 5. What if the 2nd protosample still does not meet our customer’s requirement? – If the changes were not followed by our sample room (which is very remote), we will remake and submit 3rd samples free of charge until our customer finally accepts the revised protosample and is ready to place order. If our customer makes last minute changes that were not previously discussed during the 2nd protosample development and then makes another request for 3rd proto, that 3rd sample is billable to customer. 1. To avoid any surprises to our customer, we make pre-production sample using actual material/colors and actual mold for hardwares, especially if the previous 1st and 2nd protosamples were made from available material or hardware. This pre-production sample is done after bulk fabric arrives at our factory. If there are special colors currently not in stock, we will submit fabric labdips or fabric strike offs for our customer’s approval prior to dyeing and/or printing once the 2nd protosample has been approved and prices have been accepted. 2. What will be the cost of pre-production sample? - Except for courier cost, there is no charge on pre-production sample as this will be done after bulk purchase order is received. 3. How long does it take to submit the pre-production sample? - maximum 4 weeks depending on style. 1. There are instances when our customer wants to book orders before goods arrive at their warehouse. If so, we will make and ship advance samples for customer’s sales people to start booking orders while orders are in production. Sales samples request usually comes with guaranteed bulk order. Sales samples are normally airshipped collect to customer’s warehouse and/or to international distributors. 2. What quantity can we order for sales samples and what is the cost of making them? - The quantity will depend on our customer’s total sales force and actual bulk order quantity. Since this will be done in our sample room (not in production line), the cost of making sales samples will be higher, about 2 to 3 times our normal production cost. 3. How long does it take to ship sales samples? - 4 to 5 weeks from date of receipt of actual material, depending on the intricacies of the products. 1. We start bulk production when we receive our customer’s confirmed bulk purchase order with complete details such as quantity, price, delivery date, destination, etc., and after we confirm our customer’s order. As soon as bulk order is confirmed by our account, we put the order into our production system and immediately place order for bulk material. 2. How long does it take to deliver bulk orders? - About 40 to 60 days ex factory for the first order or succeeding orders from date of order. Once the product becomes a staple item and can meet a continuous production pipeline, we will dedicate production line exclusively for such product and delivery will be much shorter. 3. What are our terms of payment? Preferably 30% upon receipt of Bulk Order and 70% upon shipment, or by Irrevocable L/C based on full amount. Once we develop a long business relationship, we can work on terms. 1. With all stages of protosamples sequentially submitted and approved by our customer, the final or last sample becomes the “approved sample”. Our customer gets one approved sample and we keep one copy for production line reference. We make sure that bulk production turns out the same as the final approved sample. 2. By virtue of our lengthy experience in production, we tend to foresee any future production problems ahead of time and we solve them immediately before it becomes a problem. 3. From the day we receive our customer’s order, we periodically update our customer on the Production Status of each order, from material purchase and arrival to our factory, cutting, bundling, sewing, assembly and finishing. As to quality, we do “Total Quality Control Procedure” in each production step; from material inspection at the source, cutting inspection, in-line inspection and accountability and finished goods audit inspection based on AQL 2.5%. We provide shipment samples to buyers if requested ahead of time. 1. Depends on port of destination. If the port of destination is West Coast port, sailing takes 2 weeks, East Coast, 3 weeks. Europe takes 3 to 4 weeks depending on port of destination. We advise our customer of the ocean vessel’s estimated departure date and estimated arrival date at destination port as soon as the information is available to us. 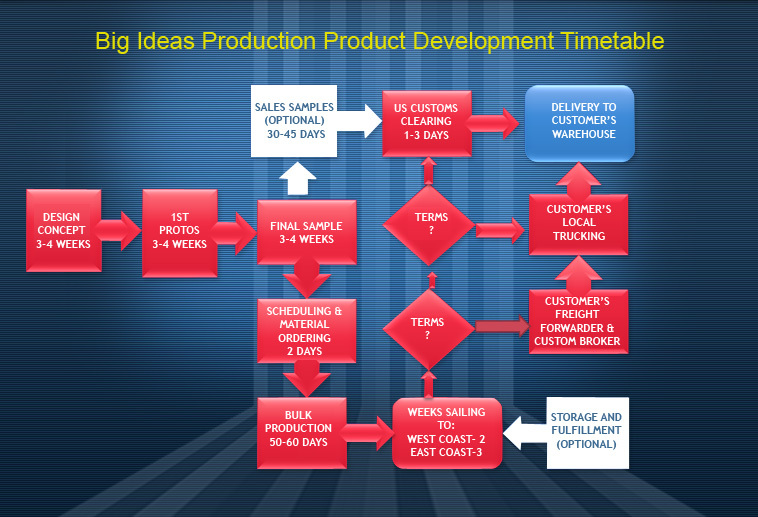 This enables our customer to plan for warehouse space for their goods. 2. Once orders are shipped, we automatically inform our customers the exact date of arrival, total boxes, total cubic feet and total gross weight. 3. If goods are destined for USA, we will coordinate pick up with our customer’s Nominated In-land Trucking. 4. Once our customer receives goods at their warehouse, we see to it or confirm with customer that goods arrive at their warehouse in correct quantity and in good condition. 1. We always appreciate feedback from our valued customers for one simple reason: To improve our service and quality and increase value innovation. So from time to time, we send out questionnaires and ask our customers to rate us on our performance and to see what other improvements we can make in order to increase the quality of our service.